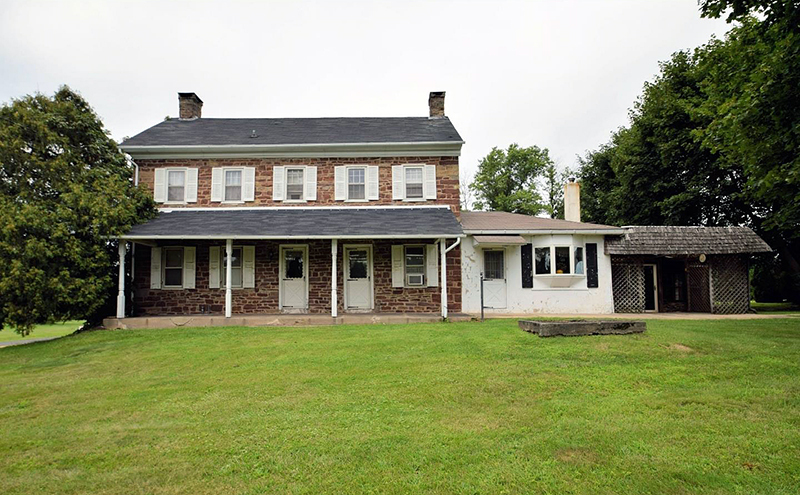 Hilltown Township municipal offices are located at 13 West Creamery Road, Hilltown PA 18927; phone: 215-453-6000. Around the time it was established (circa 1722) Welsh settlers suggested the new township be named "Aberyswith," after a town in South Wales. For several decades, the township bore its original name, Hilton. The current "Hilltown" is likely a corruption of the original name. Among the earliest to call Hilltown home (around 1718) was the family of the Welsh minister Reverend William Thomas. In 1737 he founded the Baptist church, building the first structure of stone and logs with his own hands. This pioneer pastor served his congregation for 40 years. Hilltown was the first township formed north of Buckingham. Settlers were here early in the last century, but it is impossible to tell when, and by whom, the wilderness was first penetrated. As was the case elsewhere, the first purchasers generally took up large tracts, and were not settlers. Among these we find Israel Pemberton, an original land owner in Hilltown. The commissioners of property conveyed to him two thousand acres on the 1st of October, 1716, [October 31, 1716*] in two contiguous tracts, which he sold to James Logan, September 26, 1723, and two days afterward Logan conveyed three hundred acres, in the central part of the township, to Reverend William Thomas, for 90 pounds. Mr. Thomas was one of the fathers of Hilltown, and one of the most reputable men who settled it. He was born in 1678, and came to America between 1702 and 1712. Missing the vessel in which he had taken passage, he lost all his goods, and was landed at Philadelphia with his wife and one son, penniless. He first went to Radnor Township, Delaware County, where he followed his trade, a cooper, and preached for a few years, when he removed to Hilltown, where he probably settled before 1720. He became a conspicuous character, and influential, acquired a large landed estate, and settled each of his five sons and two daughters on a fine farm as they married. In 1737 he built what is known as the Lower meeting house, on a lot of four acres given by himself, where he preached to his death, in 1757. The township is home to vestiges of nine historically-significant villages and hamlets: Bean, Blooming Glen, Fairhill, Fricks, Hilltown, Keystone Point, Leidytown, Louxs Corner, and Naces Corner. Davis, W. W. H., The History of Bucks County Pennsylvania, from the Discovery of the Delaware to the Present Time, selected excerpts, 1876, Democrat Book and Job Office Print, Doylestown, PA.